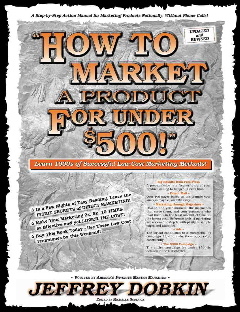 This cult classic book has more practical, useful information on how to market any product or service than you can learn in 4 years in college. Not Internet based, demonstrates traditional marketing methods: Direct Mail, Retail Stores, PR, Advertising, Mass Marketing, Magazines - it's all covered. Over 400 pages of lean marketing information in Dobkin's own brilliant and breezy conversational style of writing. More than 25,000 copies sold in bookstores. Available in paperback at bookstores (on order), at Amazon and through the publisher (DanielleAdams.com) — but now available as an e-book through e-junkie at a discounted price. Where to find markets (groups of people who are ready to buy your products and services) - the easiest way - and how to reach them at the lowest cost. Locate any magazines with easy to use magazine directories: this book includeds multiple sample pages from the best directories. How to create an effective Press Release, and where to send it so you get published. How to create a successful direct mailing package and where to buy a mailing list. How to create a successful ad, or get one you like from an agency—the first time. How To Market a Product For Under $500 isn't “about” marketing, it shows you specifially how to market - with no history, and no bs. This is everything you need to do to bring a product to a national marketplace, in under 6 months, for under $500. Dobkin is the author of 5 books on marketing and over 250 articles that have been publised in more than 300 magazines.